The Spanish King Juan Carlos abdicates on national TV citing political reasons. In his televised speech, the monarch declared that he would make way for a new generation, and clear the way “to a better future”. He will be succeeded by Prince Felipe who has somewhat better public polls than his elephant hunting father. In January, two-thirds of Spaniards favored a premature abdication of their king, whose family was recently implicated in numerous scandals. There was the 2012 embezzlement of monies amounting to millions in court, Juan Carlos himself was in 2013 violently criticized by his subjects since at the height of the financial crisis, he secretly went with a German princess for an elephant hunting safari in Botswana. Prime Minister Mariano Rajoy said the resignation was “completely normal”. However, it is unclear to what extent the corruption scandal, in which also the Spanish royal family was involved, has played a role. 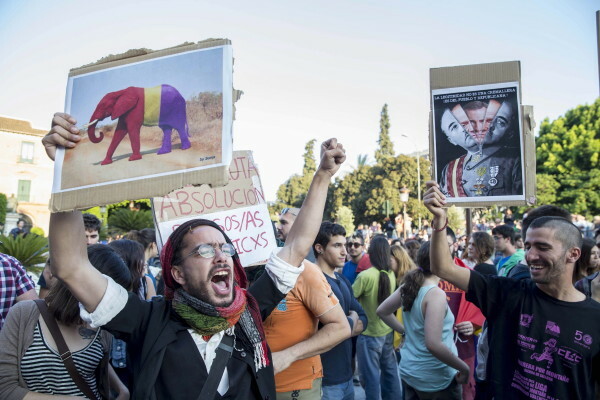 However, after the surprising abdication of King Juan Carlos of thousands of Spaniards have gathered in more than 20 cities to anti-monarchist rallies. “Spain is a republic! Morning,” the crowd shouted at the Puerta del Sol in Madrid. “No more kings, a referendum,” standing on numerous posters. Fearing riots police sealed late in the evening from access to the Royal Palace. This is typical of the financial crisis. Whoever is at the head in appearance, that head must roll.